Do you agree with the election results? Why or why not? What are your thoughts overall? The nations first Black president. I DO AGREE WITH THE RESULTS BECAUSE WON!!!! I DO AGREE BECAUSE ”OBAMA ” WON’!!!!!! it is good that o,boma had won now things will be change. i think this would be a lot different. Yes,i do agree because he’s OBAMA!!!!!! Yes, I agree with the election results because Obama won and that there is going to be change. I think the U.S. will be different in a better way. My overall thoughts about Obama is that he will be a great president. yes i do agree with the election because obama won and i wanted him to in so that means that we are going to have a change in the united states. I think that we have a great president now. This is one of the greatest moments in American History. I am proud to have Obama as a presedent. America made a grat choice. I agree that it was a great election and I know Obama is going to be a great president. I TOTALLY AGREE WITH THE RESULTS BECAUSE WE DO NEED CHANGE IN AMERICA AND ESPECIALLY WITH THE WAR IN IRAQ. I do agree with the election, i think the U.S. did a great choice in chosing Obama as the new president. I think he will be a great president that makes a better change in the U.S.
Me and my famely was voet for obama and he won the president and is famely so pround for him in is kisd and is brother. well for me their is no problem if Obama won i’m glad that he won. i think that now things well be change by him!!!!!!!!!!:. I do agree with the results. I know that alot of people wanted change and that we did need it so people would vote for change. Really what i think is that the change was need it and here Obama is. i AGREE WiTH THE RESULTS 1oo%!!!! !OBAMA OBAMA OBAMA:]!!!! OBAMA’08 WaT yAlL NoE BoUt A ChAnGe YESSSSSSSSSSSS!!!!!!!!!!!!!!!!!! I do agree, I dont know why. !WOOT WOOT OBAMA WON BAY-BEE! ¡OF COURSE HE HAD TO NOW THINGS ARE REALLY GOING TO BE DIFFERENT AND SOMETHING BIG IS GOING TO HAPPEN NOTHING IS GOING TO BE THE SAME!CHAAUUUU! I REALLY DONT CARE ABOUT THE ELECTION, BECAUSE I FEEL NOTHING IS GOING TO CHANGE. I FEEL AS THOUGH HE JUST WANTED TO BE PRESIDENT SO THAT HE CAN MAKE HISTORY AS BEING THE FIRST BLACK PRESIDENT. YESSSS!!!!!!!!! I AGREE WITH THE ELECTION RESULTS BECAUSE ITS TIME FOR A CHANGE AND OBAMA COULD BE THAT CHANGE WE WERE ALL LOKING FOR.I JUST HOPE HE COULD BE A GOOD PRESIDENT AND DO MOST OF THE THINGS HE PROISED HE WOULD DO. YEs i AGREe WiTH THe REsULt BECAuSe i WANT OBAMA To WiN…&&HE’s BETtEr ThAN MC.CAiN.. Yes I am because it’s time for a change. I DO AGREE WITH THE ELECTION. BECAUSE I WANTED OBAMA TO WIN AND HE DID. I THINK THAT THERE WILL BE CHANGES IN THE U.S. I THINK IT WAS COOL THAT A DIFFERENT RACE PRESIDENT IS IN THE WHITE HOUSE. I TOTALLY AGREE WITH THE ELECTION RESULT BECAUSE I WANTED OBAMA TO WIN THE ELECTION AND RIGHT NOW THAT MY BROTHER-IN-LAW IS SO MAD THAT McCAIN HAD LOSE AND NOW IM RUBBING IT IN HIS FACE SO GO OBAMA!! OBAMA!! yes i do because Obama is history i so glad wow i was even crying because i was so happy that was the best day of my life i will never forget that day i am history its time for a change YES OBAMA WON YEA!!!!!!!!!!! Yes I very much agree with the election Barack Obama is the right person for the job! I think that finally there is a change in the world Obama was and always will be my number one choice to be the president of the US. GO OBAMA!!! I Do Agree With The Election Results, I Think Obama Will Make A Great President. yes because i think obama will make some changes and do all he can 2 make us feel like this is a free country like we should feel……. YESS I AGREE !!!!!! !BECAUSE OBAMA WON !!!!!! I DO AGREE BECAUSE HE THE FIRST BLACK PRESIDENT AND A BIG GOOD CHANGE HAS COME. Yes I do agree and now Obama made history by being the first African-American president. I think everything is fajr about it. I am glad that Obama won. to me who the president is doesnt matter,even if my preference was mccain but i am sad that prop 8 passed an gay marigge was abnned…….my thoughts an obama is that hopefully he will do a good job leading the country an that i hope he will do a better job than bush…. yes because Obama is going to make a great president. I think he is going to bring much change to this nation. yes because he won fair and square i think. YES I DO AGREE.BECAUSE OBAMA WON.WE HAVE A BLACK PERSON IN THE WHITE HOUSE.I AM HAPPY TO BE PART OF THIS BLACK HISTORY MOMENT.I WILL NEVER FORGET NOVEMBER.4.2008. I GREE THAT BARACK OBAMA BECAME THE PRESIDENT OF UNITED STATES……..
yes i do agree becaus obama will bring a chnge to our comuities and lower all prices.and becaus he is a demacrat & he’s black. I do agree with the election cause it’s the first black president.My over all thought are that he would change the future but even though it won’t happen right away. i think it is good because obama win! I agree because he says change is gonna come and we need us a black president because slaves built the white house.This is history in the making. yesssssssssss!!! i agree 100% well the first blck president and he very educated and that he been there without no dad and stuff like the other people he can relate to and stuff he feel for us middle and lower class folks because he been there so he will make it very easy for us and that we will have a better community hopefully a better us am very happy. I AGREE WITH THE ELECCTIONS BECAUSE I THINK THAT OBAMA IS GOING TO DO A GOOD JOB AS A PRESIDENT. YES I AGREE WITH IT.HE MIGHT MAKE POSITIVE CHANGES.YOU NEVER BECAUSE HE’S BROKE HISTORY,SO FOR EVERYBODY WHO THINK HE JUST WANTED TO MAKE HISTORY BECAUSE HE’S THE FIRST AND YOU DONT KNOW WHAT A BLACK PRESIDENT IS CAPABLE OF!!!!!!!!!!! i gree that barack oboma became the first president of the united states of america. Well I really didn’t care if Obama won but it’s good that the other guy that’s nuts didn’t win. 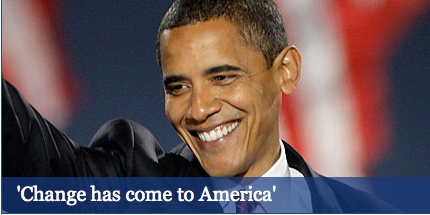 I do agree with the election results….my thoughts are that Obama will turn this country around. YES BECAUSE IT LOOKS LIKE OBAMA IS A GOOD PRESIDENT AND HE HAS RESPONSIBILITY !!!!!OBAMA!!!!!! I do agree with the election because it was time for us to have a chenge.Having Obama as the president he will make this a better country. I AGREE WITH THE RESULTS OF THE ELECTION.I WANTED BARACK OBAMA TO WIN AND IM HAPPY WITH THE NEW PRESIDENT.I THINK THAT OBAMA WOULD MAKE A GOOD PRESIDENT. Yes I do agree with the elections result because obama will change the economy. I AGREE WITH THE ELECTIONS RESULTS. I AGREE WITH THE RESULTS BECAUSE I THINK BARACK OBAMA HAS MORE POTENTIAL IN CHANGING AMERICA! my thoughts of obama is that it looks like if he will try to make a change here in america like he said he would. I do agree on the election results because I think Obama will be a great president.Everyone that voted for Obama,trust him and I do too.I think he will change all of the U.S. I AGREE OBAMA IT’S A GOOD PRESIDENT!!!!!!!!!!!!!!!!!! yes i totally agree not only is Barak Obama going to do a good job but he is also going to go down in history as the first black president congrats to obama!!! im not glad with prop 4 i think it is wrong that you have to be 21 to drink 18 to smoke but you could be whatever age you want to get an abortion without parental consent…i dont even think abortion should be legal…that is some bull…. i agree because i wanted obama to win and i wanted changes in my community!!!!!!! to win the candidate of president. YEAH I AM BECAUSE THE PRESIDENT IS A GOOD MAN.AND THINGS WILL CHANGE. Yes I am satisfied, because he is the first black president in the United States. Yes I very much agree with the election Barack Obama is the right person for the job! I think that finally there is a change in the world . yes i agree with the election cuz i wanted obama to win any way. Obama has change and good idies for america and thats what we need. I guess I agree with the election results since Obama won but I don’t think there is going to be any real “change”. I agree because we need change.Obama will be the greatest president. I DO AGREE THE ELECTIONS WERE FAIR BECUASE EVERYTHING WAS IN ORDER.OBAMA WON WITH HIS VOTES.AND MCCAIN LOST WITH A LOT OF VOTES. Because he’s freakin awesome! lol. could bing back the troops in Iraq. Like Duh! i do agree with the elction results. i agree, for america is a nation that needs major change in its decisions and acts. barack obama promises to make those changes happen and help our nation succeed with his help and leadership. america is also making history by having our firts African American presindent. BARACK OBAMA!!!!! BARACK OBAMA !!!!!!!!!!!!!!!!!!!! BARACK OBAMA !!!!!!!!!!!!!! !BARACK OBAMA !!!!!!!!!!! i do agree with the election results…. why because ti think that we need a change a change that we no that we need a diffrent pesident… a presedient who will take care if busness on like BARACK OBAMA why beacuse the united states need a chanse we need a chanse.. I Think that OBAMA will take his word 4 granted.. i think that he didnt lie about wat he said he was oing 2 do..
OBAMA #1 WE MADE HISTORY UNITED STATES OF AMERICA…. YES OF COURSE IT MAKES ME FEAL PROUD OF MY STATE NOW WHY? BEACAUSE NOW I NO THAT WE HAVE A PRESEDENT THAT REALYWANTS TO MAKE THE U.S BETTER.. AND A PRESEDENT THAT REALY DOES CAES ABOUT US A PERSON LIKE OBAMA DESERVES RESPECT..